Philadelphia Eagles quarterback Carson Wentz "answers" questions following Monday's practice. It’s almost a shame that the start of Eagles training camp overlaps with the Democratic National Convention in Philly. There’s so much political activity going down right across the street from the NovaCare Complex, and poor Carson Wentz won’t be able to use this week as a networking opportunity. Because if this whole football thing doesn’t work out for the rookie from North Dakota, he may have a future in politics. Ideology and platform aside, he's got the whole speaking-without-really-saying-much-at-all thing down pat. No matter the level of coverage his North Dakota State Bisons got during his time in college — shoutout to the reporters from Fargo, ND in attendance on Monday — it can’t possibly compare to the media attention given to NFL players. Specifically to quarterbacks. Especially in Philadelphia. But that doesn’t seem like it’s going to be a problem for Wentz. Not yet, at least. A better test will come the first time the second-overall pick struggles or gets in trouble. For now, however, we can only go off the relatively small sample size we have. 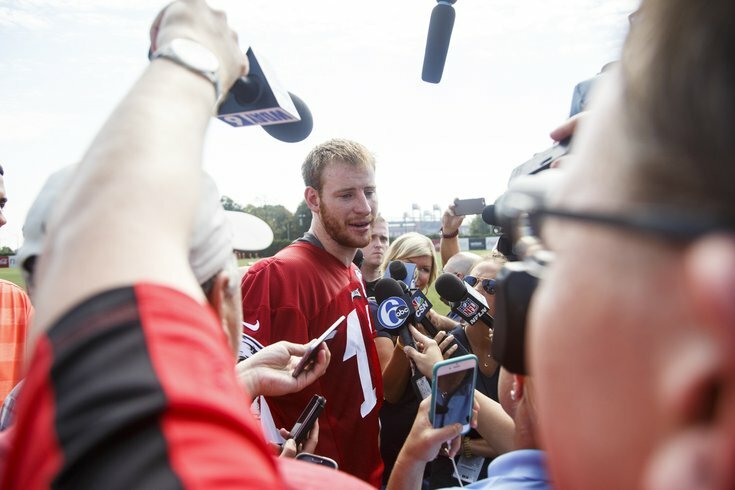 As the Eagles opened camp on Monday, Wentz was undoubtedly the center of attention — and eventually the literal center of attention as a mass of eager reporters surrounded the quarterback as he walked off the practice field. That’s about four and a half minutes of Wentz’s session with the media. Did you notice anything about it? Did Wentz say anything? Sure, he spoke slightly more than 700 words, but did he really say anything? If he did, I missed it. Eagles: "They're probably going to ask you about coach's plan for you, Sam and Chase, and whether or not you agree with it." Wentz: "Oh man, that's a tough one because I want to start but Sam's my buddy. What should I do?" Eagles: "Easy. First, tell them it's not your decision. They love it when players respect authority. Then, tell them all you can do is work to get better, because that's what this is all about right? Putting team before self is always a crowd-pleaser. And finally, tell them you're going to be ready when the time comes." Eagles: "Oh, yeah. Keep it short and simple. It gives them less to pick apart and pull out of context." Wentz: "I can handle that." And he did. In fact, he nailed it. While he looks engaged and not at all bothered by his obligation to speak to media, his answers are brief and considerably less than revealing. In a word, they're safe. On Monday, that was about as long of an answers as Wentz would give. Now apply that thinking to any of the questions he was asked and go back an listen to the answers. They're about as vanilla as you can get. Actually, that's wrong. Vanilla at least has a flavor. These were more like dry cardboard. The most interesting thing he said was about being woken up at 5 a.m. by the same storm that woke his coach early Monday morning. And even when asked about his recent viral bathroom mishap, a chance to perhaps draw a chuckle from throng of reporters, he deflected. Come on, man. Give us something that resembles personality. As a reporter, it's not fun having someone play defense as you attempt to peel back the Shrek-like layers and get to the human being underneath. As an NFL coach, general manager or owner, however, guys like Wentz are exactly the type you want being the face of your franchise. We don't know Wentz personally, but professionally, he's just not interesting. Luckily for him, he doesn't have to be in order to be a fan favorite. That will come with wins. Here's the full of the transcript from Wentz's Q&A, some of which did not make it into the above video. What are your feelings like on Day 1 of camp? What did you work on the past few weeks? Are you used to having all eyes on you? A lot of media here, including from Fargo. What’s that like? “It’s awesome. It doesn’t surprise me. The support that I have, that the North Dakota State University program has is unbelievable back home. And that support is awesome and I’m glad they can be out here. How was the week in San Diego with Sam Bradford and Chase Daniel? What did Sam Bradford and Chase Daniel tell you? Did you talk to them about footwork? Where have you grown the most since stepping on Eagles property? What’s the objective from now until Week 1? “Just get better, just like the same objective as the whole team has. Just to get better and keep getting better as a team. Individually, we all got to elevate our game every time we come out here. We got a lot to learn especially out here today with a lot of the young guys. The goal is just to get better and take a step forward every day." Is it cool to see former teammate C.J. Smith here? On the Eagles’ plan... Do you want to play? “You know, it’s totally out of my control. I’m just out here every day. We got a long camp ahead of us, we got a lot of work to put in. And the biggest thing I’m focused on is just helping this team get better and getting myself better. And I can guarantee whenever my number is called, I’ll be ready. Your biggest goal heading into the season? Is this like a redshirt year for you, almost like at NDSU? Are you using that same type of mentality? A lot’s been made about the relationship you have with Bradford. How’s that going? Do you feel the excitement and pressure around the city on you this season? What did you learn during your week in California with your new teammates? Were you surprised by how much attention you got for locking yourself in a bathroom?